Yet another recipe inspiration following the gluten-free and dairy-free food regimen. I must admit that I'm thankful that my family does not have any food restrictions which allows me the freedom to choose almost any kind of ingredient (only real food ingredients). Quality and source matter!! Today's inspirational recipe hails from Simple Foody. Click on her name for the full recipe. As always, I put my personal spin on the recipe. The reason for my modification today was I didn't have all the ingredients so I subbed hence creating my own version. I made these muffins the same night I made the grain-free meatloaf as seen here. As soon as my husband came through the door from work he commented, "What ya cookin' good lookin'?" I smiled and said, "Something new!" These muffins were cooling on the stove top when I was preparing our son's dinner dish and he grabbed one and ate it real quick. Either he was hungry or ... Well, come to find out, he enjoyed them. He ate another after dinner and took 2 the next day to work for breakfast. They're very filling. Not too sweet. Just right! My son also took one to school for after lunch two days in a row. We are big fans of this recipe in my house. I know you'll like them too! My modifications are in parentheses. 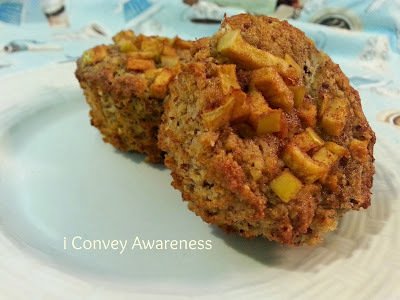 She calls them Apple Pie Spice Muffins - but I didn't want to use the same name since I changed them. Her recipe is completely grain-free and dairy-free whereas mine is gluten and dairy-free. I ran out of almond meal so I subbed in oat flour (I used gluten free oats as seen here). Use her recipe or mine, we'd love for you to link back to our blogs when you do. 1. In a large bowl combine all the wet ingredients and whisk until they are mixed well. 2. Add the dry ingredients and stir until just combined. To make oat flour, place the one cup of oats in your food processor and give it a whirl until they're in a powder or meal texture. This is my favorite tool to use for any processing of ingredients over 1/2 cup and for smaller measurements, I use this. 3. Fill lined muffin tin with batter 2/3 full. Be sure to follow Simple Foody on Facebook. I do receive a small commission from Amazon.com if you purchase anything through their site using one of the links above (read my full advertising disclosure here). Thank you very much for your generosity in helping to offset the costs of website upkeep, so that I can keep sharing wellness resources with my community and beyond. If you're interested in learning more about how to choose quality, real foods for your family, you may enjoy my online L.E.A.N. start "Nutrition Simplified" classes. You can learn here. OK, these look so good! We'll definitely have to give them a try! Oh, muffins, such pleasure! Thanks for this gluten-free/grain-free option! I want those for breakfast tomorrow! These sound delicious. I love muffins. I have been experimenting with tiger nut flour. I usually do 50/50 almond flour and tiger nut flour. My kids will love this! Yes I've seen some of your posts on IG. I'm interested in learning more about this tiger nut flour. These sound like the perfect breakfast muffin! Yum. These look delicious - and I love the ingredients list! Oh my gosh, these look great. Do they freeze well too? My husband has to have some kind of muffin or pastry each morning with his coffee. 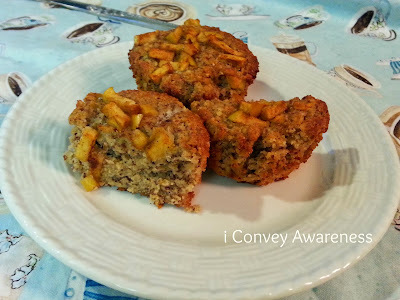 This muffin recipe is absolutely perfect for my family! Would this recipe work with an egg substitute? I'm going to try it. Thank you so much for sharing your healthy and delicious Double Apple Muffins with us at the Healthy, Happy, Green and Natural Party Blog Hop. I'm pinning and sharing!